Free items from Atkins — still available. 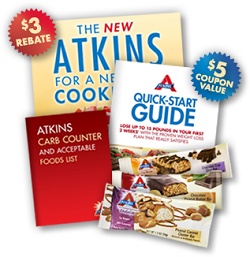 Get the kit with 3 Atkins Bars, Cookbook, Quick Start Guide and Carb Counter when you join the Atkins Community. Included will be $5 Atkins coupons. Just create a free account and your free things will be on the way! 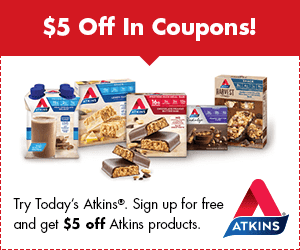 Also, grab the Atkins printable coupons!